CAGED system practical lesson that concentrates on the Diatonic scale and its association with the CAGED chords. However with a how-to-practice-CAGED-scales twist – utilizing Truefire’s Carl Verheyen country track. This post is designed to get you out there practicing your scales in a totally different method. This post will challenge your ability to think whilst playing as well as right hand alternating finger speed. It is all about making scale practice fun, interesting and challenging with the CAGED system. 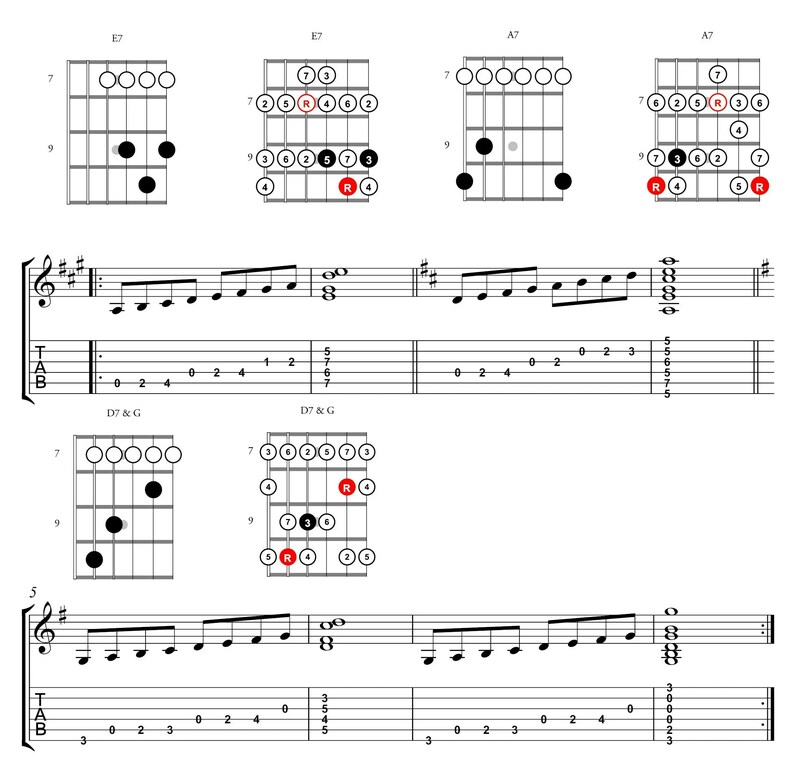 Two quick quid pro quo’s: 1st-I stuck to a very basic up down interpretation of these scales due to time constraints but it is easy to grab your favorite patterns and practice them up and down too. And, 2nd, before we start, this post is not designed for beginners – sorry. You will need to have gone through your scales and most especially your CAGED scale patterns. You will need to have these shapes reliably under your fingers as this exercise will challenge you to think ahead, especially at the top tempo. So practice slow at first and then ramp it up. The great thing about practicing scales like this is you get to hear the keys change. As we move from A major (3 sharps) to D major (2 sharps) to G major (1 sharp), you can see and hear the notes flatten. This is great aural training as this is a basic cycle movement, Cycle of 5, and something that crops up in music of every century. If you don’t know or recognize CV’s name don’t worry, you are not the first, however you will have listened to his guitar playing already. He is one of the big sessions monsters that the studios employs to play all those cool guitar parts, from Ratatouille, Cars 2 to Star Wars, to many (seriously so many) more films. If you want to get hold of Carl Verheyn’s SWAT Improvisation course (click here for direct link to it), from which this track is taken from. This is his Study 6 from this course – Country Groove. If you haven’t already check out the CGRocks detailed course on CAGED – it begins ends with this link to lesson 3 below – please do! It has a full list of links to the whole course. But, if all of that is not possible, or you just want to kick your practice up a notch. Take the ideas from this lesson, playing changes and in scale positions, and use them on a track of your choice. It will make practicing scales fun and you will exercise your improvisation skills as well. Here is a quick overview, from Truefire, by the man himself on what his course is all about. There is tons of information, theory, techniques and guitar ideas, that you would be busy for a year to trying to get it all in. This book is currently out on Amazon for print on demand or e-reader. It steps through the CAGED system and how it can help learn and play a classic classical guitar piece such as Las Abejas by Agustin Barrios.